[PS4] Assassin's Creed Rogue Remastered Review: A Worthy Upgrade or Cheap Templar Trick? Assassin's Creed Rogue Remastered Review: A Worthy Upgrade or Cheap Templar Trick? With a promising narrative and established gameplay structure, Assassin's Creed Rogue Remastered fails to innovate from its predecessor or meaningfully improve upon its original release. Having played every Assassin's Creed main entry up to this day, the only ones I'd so far missed had been Assassin's Creed Rogue and the Chronicles series. Coming out at the same time as the (then) next-gen Unity, the original Rogue lived up to its "rogue" name in the real as well as the virtual world -- left behind for the shiny new graphics and updated systems. Indeed, Rogue is a strange and bewildering conundrum. Overshadowed by the potentially inferior Unity, but comparatively not meeting the same high standards of its predecessor in Assassin's Creed 4: Black Flag; a game who's template it follows almost to the point of out-right replication. Many people, myself included, passed on Rogue the first time around. Ubisoft clearly noted this and decided to try and address it using a new remastered version. So the question is now with the jump to current-gen hardware, is it worth going back to experience this remnant of Creed's past, or should it have been left as the outcast it appeared to be? 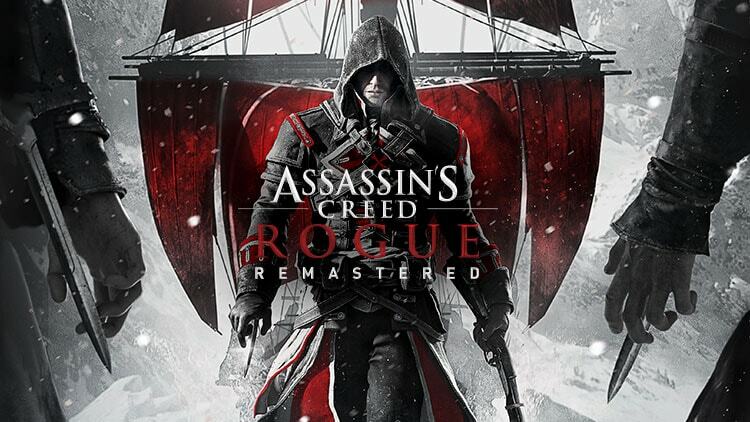 Assassin's Creed Rogue focuses on the character of Shay Patrick Cormack, a man of Irish descent who starts the journey as a faithful, youthful and petulant assassin, but quickly trades the life of the creed to switch allegiances to their age-old enemies, the Templars. This premise starts off intriguing and exciting; discovering the motivations and events that drive Shay's betrayal of his likeable band of brothers and sisters for the control and power-hungry Templar order. Unfortunately, this switch happens exceptionally early and quickly within the story, with little real exposition to become engrossed in. In many ways, we can empathise with Shay's reasons for leaving his loyalty behind and it creates a vastly different perspective from which seasoned Creed players can now perceive the Assassins. However, the game fails to adequately build upon this great foundation, glossing over Shay's actual development. In the space of two in-game sequences and a handful of short missions, Shay turns from loyal assassin to complete nemesis, with little regret or meaningful remorse. He never truly struggles with his breakaway, so we never see an emotional depth that could have served the story some real connection or dilemmas for the player to ponder. After sequence 3, the game skips forward by one year, effectively telling the player Shay is now a seasoned Templar and that's how it is. One of the most important sections narratively is glossed over, creating a real missed opportunity for us to experience the real change in the central narrative arc. The rest of the story is fairly standard, as you are tasked with retrieving an artifact (which you acquire and lose for both sides) to unlock a powerful precursor sight. Shay is ordered with hunting down and defeating his previous comrades one-by-one as the sequences pass by. But once again, while Shay has the odd line devoted to showing some sense of moral conflict, he very rarely shows anything other than determination to do what he thinks is right. Overall, the story segments in the game are short, limited and generally forgettable, which is a shame for a game with so much promise behind its central themes of loyalty and betrayal. Sadly, the central gameplay loop of Rogue is regurgitated from its predecessor almost identically. 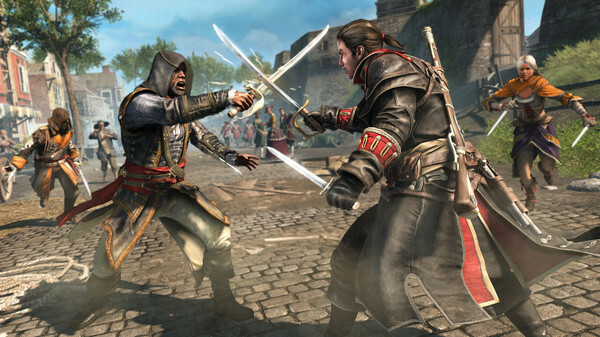 You'll spend time doing all the same things you did in Black Flag, with a couple of new additions -- capturing forts, stabbing grunts, infiltrating supply camps, suppressing Assassin HQs, engaging in sea warfare, sneaking past outposts and generally causing as much havoc to the Assassin order as your Irish legs can muster. The addition of supply camps and Assassin HQs are minor at best, and superficial at worst. Rather than being meaningful changes or adding anything to the experience, they exist simply to re-package the same gameplay you've already experienced dozens of hours of. The combat for both land and sea remain largely the same, with Shay's only notable acquisition being a rifle that now has an attached grenade launcher. Unfortunately, even this acts as a missed opportunity, as the grenades available are identical to the darts we'd been using for about two games prior, berserk and sleep, with the addition of traditional shrapnel grenades. It seemed this may have been a great opportunity to freshen up your stealth and action options, but instead feels like a meaningless add-on which only serves to make the game easier. One of the few differences is the addition of stalkers, whom will hide out in various secluded spots and try to slice you when you least expect it. They're an interesting concept, but they telegraph their attacks so brazenly you almost always detect them, leaving the process of countering them as more of a chore than exciting challenge. That's not to say there isn't any fun to be had in Rogue's moment-to-moment engagement. Successfully infiltrating an outpost or settlement without being detected, taking down a particularly strong enemy or laying waste to multiple guards is still wickedly fun and fast-paced at times. Additionally, the naval combat is still epic in scope and exciting to execute, firing of cannons and mortars while avoiding fire from half a dozen ships is still just as invigorating as it has been before. It's just such a shame it feels so abrasively familiar. Within 10 minutes of playing Rogue Remastered it felt like I was right at home from my time with Black Flag or AC3, with little actual development of skill or ability, coupled with same animation and design for things like legendary battles and harpoon activities. The main story missions do an admirable job of attempting to get you thinking on how to approach and dispatch your targets, with significantly fewer tailing missions being a massive improvement. These can sometimes feel weak or lacking in exciting design however, with many of the stealthy or "better" options scripted blatantly with write my paper help and environmental cues and hints -- there's only so many times you can see a tree branch over-hanging an essential enemy character before it becomes ridiculous. What's also glaringly ridiculous is how Ubisoft has so obviously padded out Rogue, stuffing it with pointless collectables. By the time I'd finished the main campaign story missions (which only took about 7 in-game hours), I'd only discovered about 1/4 of all the locations, forts and HQs in the game, and that's with me purposely having visited most of the ones on route to missions! The rest of your 20-30 hour playtime will be collecting over 200(!) animus fragments, shanty's, chests and items to unlock new outfits or weapon sets. Generally, most of Rogue feels like filler content, with the meat of the package proving to be a rather limited dish. It's not only the gameplay additions that feel somewhat superfluous though, with this version being a remaster it's important to assess the changes made for this upgrade. Once again however, Rogue Remastered disappoints, with distinctly mild or almost non-existent improvements to its graphics capacity. Character models show their age, animations are comically stiff in comparison to the current standard and don't even look at people's hair for fear of being put off completely. The game has been enhanced to promote the use of 4K and 1080p on a PS4 Pro for example, but given the game's now lacking visual fidelity, it wouldn't make much of a difference. Moreover, the game technically still has problems, as I experienced two in-game crashes during my time playing, one occasion where Shay became permanently locked into an attack animation pose so he couldn't move, and another instance of a soldier body clipping through the floor of the game (with the essential key I needed to progress). All of these are relatively forgivable given the generous save system, but they were a pain nonetheless and shouldn't be occurring in the prime or enhanced edition of a game. Finally, the two additional missions included from the original version again add little to the Rogue's enjoyment factor and the customization options are artificial and largely pointless. Much like the rest of the game, they feel tacked-on and lack any real value for the experience. Should have remained a Rogue? Assassin's Creed Rogue Remastered is something akin to an easter egg. With a tasty, exciting and enjoyable exterior, but completely and utterly hollow within, lacking any form of real substance. There's the skeleton of a great game within its foundations, as we all discovered with Black Flag, so it's a shame it chooses to replicate, rather than evolutionise the formula that gave it life. The changes made for this remaster are minor, adding little to the original experience or improving it in any significant way. As a first time player of Rogue, I enjoyed some of my time decimating the Assassin order, with a story and main campaign that had genuinely enthralling moments. What a shame then, that the rest and majority of the game lacks any form of depth or development. If you never played Rogue originally and had a fleeting interest, you may find it worth searching within this outcast. But for returning players or everyone else, you can avoid Shay's enhanced adventure without much fuss.